There is a tricky little area with claws along the low road and spike walls on top. Immediately afterward, there’s a mine cart rolling toward you – – jumping on it is about the only way that you can reach the ” B ” power – up way up top (which will make the rest of the level so much easier, of course). A floating ” M ” power – up will tell you that end of the stage is near, but there is one last nasty area: a series of long claws followed by a spike wall immediately afterward. You will need to move back and forth UNDER the claws (very carefully, of course) while shooting the wall. A few more basic enemies later, and you will be at the boss. With the Spread power – up, this fight is easy; otherwise, it can be tricky because plenty of enemies appear, along with a pair of turrets down below that shoot triple – balls at you. Your true target is the glowing orb – lock above the door. Shoot it, and you will be done. Almost right away, two floating power – ups will come from the left – – you will want the bottom one most, it is a ” B ” that helps considerably. The top is an ” M ” (i.e., there if you really want it). A little farther, you will see the rolling face – hugger aliens and then a big old alien head that blocks your way and spawns more rolling enemies. Shoot it and the wall in front of you crumbles. Next, you will be in an area with wall – mounted alien mouths that spit tracker – bombs at you. These bombs start slow but pick up speed quickly, so they can be a pain to deal with. 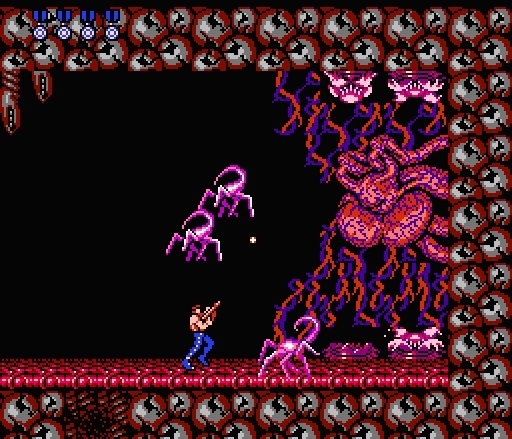 The ‘mother’ alien (Red Falcon) is a fairly easy fight after everything you have done to get to this point. The sacs on the ceiling and floor will periodically emit the walking face – huggers, and there is a mouth – turret below and to the left that can give you some trouble, so taking these out could help matters. However, your ultimate target is the heart, and it doesn’t really need to take much damage before it explodes; a dozen or so Spread shots should do it (it beats faster the more damage it takes). FALCON AND SAVED THE UNIVERSE. If you let the credits roll, you will end up starting from the beginning on harder mode, keeping all of your points and current power – ups.